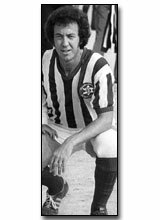 In 1967, Eli Marmur emigrated from Israel to the United States and played professional soccer with the Oakland Clippers of the North American Soccer League. In 1973, he was named captain of the United States Maccabiah Soccer Team that competed at the World Games in his homeland. Marmur went on to play on the (semi-pro) Maccabee Athletic Club's (Los Angeles) Soccer Team, and was a key player in MAC’s three National, three California, and seven Los Angeles Cup Championships. Born in the Holy Land, Marmur played on the International Youth Soccer Team and in the National League with Hakoah. His teams won two Championships and one National Cup. When he retired from active competition, Eli took on the position of President of the Maccabee Athletic Club, and became known to many in the Los Angeles community as “Mr. Maccabee”.